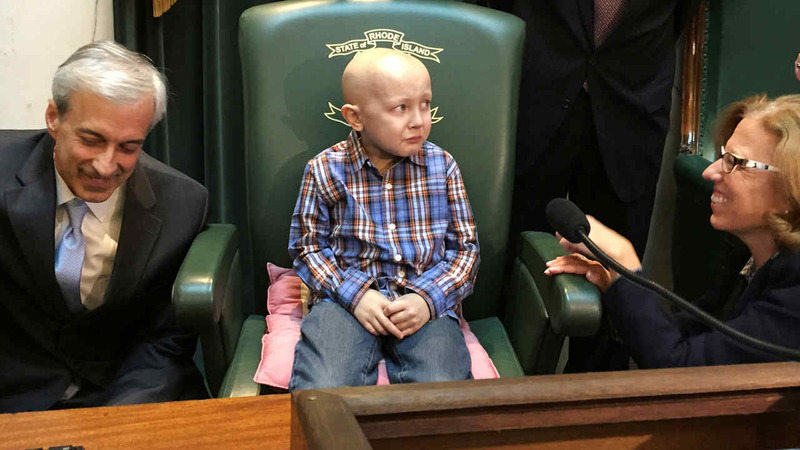 RHODE ISLAND -- An 8-year-old Rhode Island boy with terminal cancer whose dying wish to become famous in China reverberated around the world has died. Dorian Murray died Tuesday, according to a post on the boy's official Facebook page. "He was surrounded by people who love him and his transition to heaven was very peaceful. He was embraced by both mom and dad," the post by family friend Kathryn Thomas said. Dorian, of Westerly, was diagnosed with a rare and untreatable form of pediatric cancer called alveolar rhabdomyosarcoma when he was 4. After cancer cells spread to his spinal fluid a few months ago, he and his family decided to stop his chemotherapy treatment so he could enjoy the time he had left. Not long after, Dorian told his father he wanted to be famous in China before he went to heaven. His father, Chris, a police officer in Stonington, Connecticut, posted the wish on Dorian's Facebook page, urging people to use the hashtag #DStrong. It spread across the globe. People from places as far away as Australia and Florida sent him photos and well wishes, and #DStrong became a trending topic on social media. It especially took off in China, where people sent photos of themselves on the Great Wall holding signs reading #DStrong. Dorian and his family also received invitations to travel to China, but declined due to his health. The Rhode Island General Assembly declared Jan. 20 "#DStrong Day." Dorian's family announced earlier this week that they planned to establish the Dorian J. Murray Foundation to raise money for pediatric cancer research and to help support families of children with pediatric cancer. Democratic Gov. Gina Raimondo called Dorian a hero. "At my breakfast table this morning, my kids and I said a prayer for Dorian, and my son said Dorian's got a one-way ticket to heaven," Raimondo said Wednesday. "That little boy inspired us, and our heart and thoughts and prayers go out to his family." People in the community expressed sorrow at Dorian's death, including Roy Seitsinger Jr., superintendent of Westerly schools. He told families in a message that Dorian was a "precocious, gregarious, and loving little boy," the Westerly Sun reported.